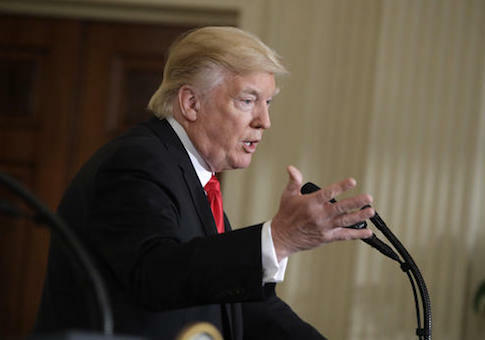 The Trump White House has omitted mention of the slaughter of 6 million Jews in its official statement in honor of Holocaust Remembrance Day, a first for any White House, the Washington Free Beacon has learned. The Trump administration’s statement honors "those who died," but does not specifically mention the systematic murder of more than 6 million Jews by Adolf Hitler’s Nazi regime. This is the first time a White House has issued a Holocaust Remembrance Day statement without mentioning that Jews were the primary victims of this slaughter and that 6 million died as a result of anti-Semitism. Yet, we know that in the darkest hours of humanity, light shines the brightest. As we remember those who died, we are deeply grateful to those who risked their lives to save the innocent. The Obama administration’s 2016 statement explicitly referenced the 6 million Jews and the millions of others murdered by the Nazis during the Holocaust. Similar statements were issued in 2015, 2014, 2013, 2012, 2011, 2010, and 2009 by the Obama administration. Former president George W. Bush made similar statements during his time in the White House. Multiple White House officials did not respond to a request for comment on the matter. This entry was posted in Issues and tagged Trump Administration. Bookmark the permalink.